Winter is coming and it is time to check out beautiful places in the Caribbean. which is the unofficial capitol of the Riviera Maya. Just next to the vibrant 5th Avenue locate is the beachfront Community of Playacar Fase 1.
you can find luxurious and modern Homes for sale as well as laid back Caribbean Design in many of the Beachfront Villas and Condos. You have 24/7 security and great landscaping with tropical trees and plants everywhere. One of the high lights apart from the sandy beach are the ancient Mayan Ruins. Very simple, it is a tranquil part of paradise in the middle of one of the most demanded tourist areas in the world. You can expect high rental income on your property, great appreciation and if you look for a fantastic real estate deal, just click on the picture above. In one of the very few condo developments, we are able to offer you a very spacious 2 bedroom garden floor apartment. Unlike the property for sale on this side, this shared real estate listing is available at 210k!!! So instead of 299k you will get a 90k Discount ! 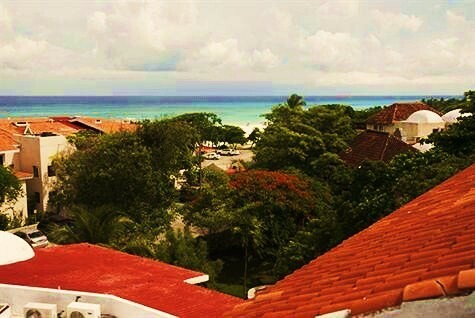 Contact us for more info on this special bargain and come down quick to see with your own eyes a fixer upper just 50m from the beach, in easy walking distance to the famous 5th Avenue and all the night life, live in a very upscale and quiet neighborhood like Playacar Fase 1, make great rental income. enjoy the amazing ocean views from the common area rooftop. For more Info about Real Estate Deals in Playa del Carmen you can always check out our Website and of course if you like to find more about Playacar Property, just click here. Please make sure to follow us as well on Facebook and Youtube.